Yes, government policies temporarily stopped prices from finding their natural levels. Now that the tax credit has ended, and most mortgage mods are failing, the prior downtrend in price will now resume. Neither the Bush nor the Obama White House seemed to truly understand this. The assumption has been that if we can modify mortgages or voluntarily refrain from foreclosures, the RRE market will stabilize. Through a combination of mortgage mods and buyers tax credits, the government has managed to — temporarily– create artificial demand and keep more supply off of the markets. But as we have seen, that fix was at best temporary. One of the things that Markets are best at is price discovery — the determination of a price for a specific item through basic supply and demand factors. Without the heavy hand of the government intervening, the residential real estate market is about to experience what price discovery is all about . . .
Nice charts..... I presume you mean a second leg down is necessary to take the curve back to, or below, mean levels? If I was in the US by now I would have bought - and a ruddy nice house also. I was thinking the same thing. Nice for them but what about the overpriced crap we have in this country? Its a given the US are going into a second dip in housing as the air was partly prevented from fully escaping from their bubble with government subsidies now being withdrawn. There is some merit in showing US stuff though. We usually follow them albeit with a HUGE lag this time. In the Great Crash of 89-96 the lag was about a year. This time its probably going to be 5 years before the full effect is felt here. They started to go down in 2006 and apart from a small respite in the last year its not stopped. We, on the other hand, started to go down in 2007-8 but then it stopped in 2009-10 due to low IR, frightened banks (they had no stomach for mass repossessions) and artificial stimulus to keep jobs going. I was in Southern California earlier this year and was looking at smart 2 bedroom condos on the 4 Seasons Golf Course in Carlsbad, CA and you can buy a nice 2 BR for around $250k. $500k at the peak. Florida is about half of CA and you can buy a fabulous gaff for around 120k or around 80k pounds. The problem with FL is that the weather is awful and it gets too windy. Southern CA is as close to perfection you will find anywhere on the planet--high temps rarely above 82F and lows rarely below 50F. CA has lot of problems and I expect their houses will drop a further 20% or so to bottom. Last time round was not as overpriced as now, and it took 6.5 years to hit the bottom o the market. Nominal prices flatlined and inflation ate away at the real price. With all the QE we may get something similar here no? It could well take longer this time round, I wouldn't expect the market to go anywhere until at least 2013 or 2014 at least. Sure, but it would be enormously helpful if people could make it clear when they're posting stuff from the US. Connected, maybe, but not directly. So why hasn't it happened here. Perhaps we have a housing shortage after all? When America gets the flu we die. I think this is partly true. IIRC Ireland have a huge outflow of population as the job markets has imploded. Read today we have 600k more people this year than last. Translate that into houses required and its easy to see the supply side preventing houses from dropping. Immigration is still running high in this country for some reason--is it the benefits? WTFK. Thankfully its more than just supply issues that the market needs to stay inflated. Job losses will spur repossessions and the government will have to house people in Nissan huts if necessary. We may see some outflow of population but at the moment we are seeing more people coming in because we have, so far, escaped any austerity as a result of what the rest of the world is experiencing. I see a similarity with that HPC famous chart.....! Cannot compare America with the UK! UK is tiny in comparison, with stricter planning laws and less houses being built. Much more pent up demand here too, more house-owning obsession, more private landlords / wannabes and a second home culture. HPC won't happen here, we are stuck with high house prices forever! Time to emigrate unless you are poor or very rich. There is a big world out there. There are truths in what you say. However painful. Trouble is, property is pretty expensive most places comparative to wages. Even here in the jungle. US has many housing markets, and parts like Oregon are constrained by planning laws as much as the UK, in the same way that some parts of the UK are more relaxed with planning than others. Perhaps do some research on the different parts of the US housing market, find the area that mosts reflects the SE of UK then compare. One can draw comparisons in their economies without doubt, and given housing markets are an intrinsic part of the economic activity, it is blindingly obvious that they are linked. To argue that our housing market is not aligned, but in a different timescale, is like saying that NYSE and LSE is not linked, or like their business cycles and the UK's is not linked. 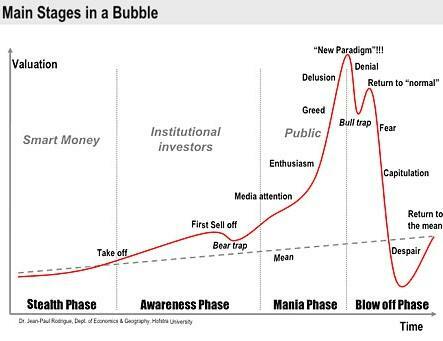 the only problem with the bubble lifecycle graph above is what you measure it in. £'s will be devalued the rate at which they are devalued is unknown. The only comparable US region, in terms of population density and economy is the New York, New Jersey, Connecticut & Mass areas. Anyone know what has happened there? How about the planning system as this is what was cited as a reason for an inelastic supply in housing. You will find that the west coast north of California is similar, and arguably so is the economy. No offence, but how do you get the idea that the graph is heading down when it is heading upwards? Look at the massive rise in the Ratio to Household Incomes up to 2007 ! How was it possible? Why would the BofE ever allow such reckless lending ?? Equally, how can anyone think the latest figure represent a normal situation? Notice that those who bought the average priced home in mid-2007 and did this with the average income, had to spend an enormous 33.3% (!) of their income on interest only (assuming 100% finance, and 25.0% if 75% finance.) That is a truly huge percentage of their income. So naturally, prices eventually headed lower, under the pressure of that ridiculous unaffordability. But you have the opposite situation today, especially for those who can borrow at today's ultra-low interest rates, or have savings in the bank, earning nothing. They may (mistakenly?) be driven to buy property, thinking they will receive a better return and that today's historically-low rates are somehow sustainable. They are not. Labor set-up a property-buyers con game, in the hope that the short-term blip it created in property prices would allow them to be re-elected. Yes Bubb, but it doesn't make them anymore affordable because no ones got a job. This has years to run.